Will Nan Rich Supporters Turn Their Backs On Charlie Crist? Some Say Yes! Contrary to popular belief, Florida has two candidates running for the Democratic nomination for Governor. Nan Rich and Charlie Crist. Crist has all but been declared the winner of a primary that hasn’t even been held yet. For the most part, the media has ignored Nan Rich and her campaign. Charlie Crist has refused to debate Rich on any of the issues that are important to Floridians, especially women. 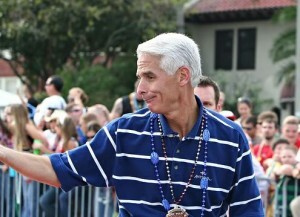 If Charlie Crist wins the Democrat Primary, this could prove to be his downfall. Polls have shown a narrowing lead for Crist over incumbent Governor, Rick Scott. These same polls do not include Nan Rich at all. I have to wonder if Charlie Crist would have a lead in the polls at all, if Nan Rich’s name were included at this point, you see, Nan Rich has a growing grass-roots group of supporters who are not happy at all with the way she has been treated. After speaking to a group of women for this article, it is clear that if Nan Rich doesn’t win the primary, Charlie Crist can kiss certain votes goodbye. The way Nan Rich has been treated is disgusting. Charlie Crist acts as if he doesn’t have to work for our votes. He acts like he is going to get them simply because he is Charlie Crist. Well that isn’t going to work with me or the women I know. Yes, we all want to see Rick Scott go, but that doesn’t mean we want to replace him with a shyster such as Charlie Crist. I can’t bring myself to vote for Rick Scott, but I can stay home. I’ve voted in every election I could, and I value my right to vote, however I could never vote for Charlie Crist. He hasn’t changed at all. The only thing that has changed is the group of people he now wants to vote for him. I won’t do it. Others have expressed similar sentiments, although one other woman did say she would have to hold her nose to vote for Crist. It is clear that in a general election Crist-Scott match-up, Crist is going to need the Nan Rich supporters. Palm Beach, Broward, and Miami-Dade counties make up the bulk of democrat voters, and women make up the bulk of that group. Women voters have decided elections all over this country, and the Florida Gubernatorial election won’t be any different. I know Charlie Crist and his supporters were thrilled with the way he behaved on camera with Lt. Gov. Lopez-Cantera in asking for Rick Scott for a debate, but it will remain to be seen whether they will be pleased when some Nan Rich supporters do NOT support him in the general election. So, Charlie Crist and the Democrats in charge can continue to ignore and disrespect Nan Rich if they want to. They will either see a lower than usual turn out of some women voters in Broward, Palm Beach, and Miami-Dade Counties, or they will see Rick Scott pick up an unusually higher number of votes in these counties. One thing is for sure, though: Crist can’t count on getting ALL democrat votes simply because he is declaring himself a democrat this election. There are democrat voters, like Evelyn, who would rather stay home than vote for Charlie Crist. Yes, we are a conservative online newspaper, but my belief in Nan Rich is genuine. I appreciate your role as a kind of anti-EMILY’s List, Leslie Wimes. I’m sure it gives Nan a real lift. Nan Rich sounds wonderful. Kudos on finding 5 people who know who she is. Maybe by August there will be over 10. I hope so. I can guarantee you that there will be enough people who know who she is to keep Charlie Crist out of the Governor’s mansion…. The grassroots women’s movement for Nan is getting stronger day by day, across Florida. The momentum is only moving forward on this. It’s quieter than Charlie, but never underestimate the power of women. Exactly Marilyn! Never, ever underestimate the power of women. We vote consistently, and we won’t fall for any snake oil salesman that promises what he says is the latest, greatest thing. I know we are in Florida, but Crist needs to pretend like we are in Missouri and SHOW US!! Oh by the way Blair, I have lots of girlfriends who will be voting for Nan. Can you believe that I know more than 10. Started the Democratic Women’s Club here… they said it couldn’t be done being in a “R” district… it was done. they said you couldn’t start a club? how odd. i am glad you proved them wrong.